Available in White, Pink, Baby Blue, Gold & Silver. Made of aluminum angle framework supported on wooden batons. Provided with fine wire mesh on sides. Wide wire mesh partition in the center to facilitate mosquitoes passing into rats portion. On side of mosquitoes a round opening with black cloth sleeve and on rats side a sliding window provided in center. - Available in two different sizes, these Cages provide excellent shelter for different animal species in the laboratory. 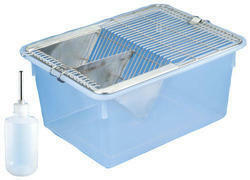 - The metallic top provides proper ventilation and has provisions for feeding the species. 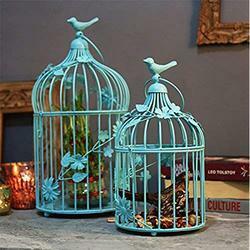 - Hi Quality Fibre Pet Cage. - Wire Steel Windows for better ventilation.